This recipe was submitted by Sarah Wilson- a San Francisco Paleo advocate, fermented foods addict and lover of all vegetables. This Recipe is adapted from PaleOMG , a delicious meal that will satisfy hungry and picky eaters alike! 1. Preheat oven to 400 Degrees. Cut the sweet potatoes in half, lengthwise and place them face down on baking sheet (I rub a little coconut oil on the cut side to help them from sticking to the sheet.) Cook 25-35 minutes until the skin is easily moveable. 2. While the sweet potatoes are cooking, heat a medium to large skillet with 1 TBSP of any fat you want (bacon fat is amazing!) on medium heat. Once the onion is translucent, add the ground turkey and green bell pepper. When the turkey is about halfway done, add all of the spices and continue to stir until fully cooked. Remove from heat. 3. Remove sweet potatoes from the oven and scoop out the insides with a wooden spoon, making sure to not scoop all the way down to the skin so that you retain the shape of the skins. Set skins aside. Place the scooped sweet potatoes directly into turkey mixture and mix thoroughly. 4. 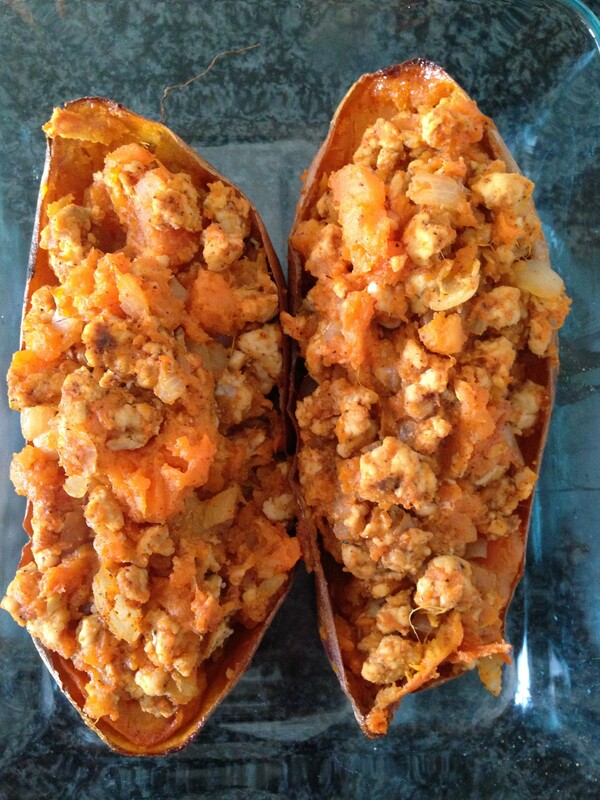 Add turkey and sweet potato mixture into the sweet potato skins (if you are adding cheese to this recipe, now would be the time to add it!) and place the skins back in the oven, face up on a baking sheet for 3-10 minutes until mixture is warmed or cheese is melted. 5. Remove from the oven and add any additional toppings.